The Civil Service was out in force for the parade, with over 120 LGB* staff and straight allies marching on the streets of the capital – more than ever before. 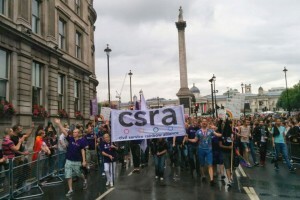 The Civil Service Rainbow Alliance (CSRA), the cross-departmental LGB* network for civil servants, successfully co-ordinated the Civil Service’s participation in the event, working alongside a number of departmental LGB and LGBT networks. We had staff join us from right across the UK, from the south west and Wales to the north east. Find out more about the day, including some of the amazing tweets of support on the CSRA blog.